Having Facebook share the exact sharing properties you have set can get difficult at times. However, the best part of optimizing your Facebook sharing is that Facebook gives you the necessary tools to debug any open graph issue you might encounter. 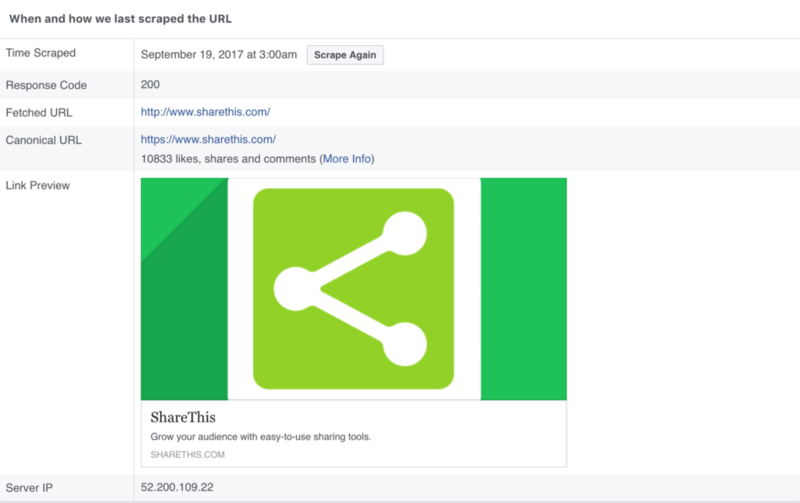 Once you insert the appropriate link, Facebook will show what they are scraping on their end and how the sharing properties will appear within their environment. The debugger will also show an error tab if you happen to forget to include a certain meta property. You’re also able to use the “Scrape Again” option which alerts Facebook’s crawlers to go to your website and update the meta properties. We recommend giving this feature a go if you recently updated the open graph tags but they aren’t showing up correctly on the front end. Note – Please keep in mind that ShareThis does not have control over how Facebook pulls sharing information from your site. By using the above methods and Facebook’s Open Graph Debug tool, you will have all the resources needed to optimize your Facebook sharing.